The pack has settled somewhere in the north to rest up before they move on. Calder seemingly made yet another appearance to the pack after tailing them for sometime. * Ayaka too would have stuck close to the pack, watching their surroundings as well as the skies for any that should think of appropriating their kill, laying on the carcass’ opposite side from Kova. She perked then, turning to watch her sister gnaw on the goat’s horn, shifting restlessly. She wanted to get everyone up and moving, yet she held herself, careful to await the Beta’s decision. * Fianna weight on her left side, but only what she felt it could handle without stress. <Calder> »» to the stone and retreating from the sanctuary. * Fianna stood at the top of a small rise just off to the pack’s left. She figured the least she could do was station herself where she could see a long way. She could watch, be wary. Scenting the cold air, she tucked her tail around her paws more closely, keeping a shiver at bay as she thought of Atraya, of Faolan, of Rook. Where were they now? Were they okay? Did they yet live? * Ayaka trail early anyway, provided it didn’t snow hard again before they left. * Fianna would nod in agreement to Ayaka, nosing Kova as well if the fae was with her, trying not to look too worried as thoughts of the alphess still hung heavy on her shoulders, the scent of the scrap of fur, Calder and her mother’s scents both, causing a residual quaver in her muscles which she had to focus to settle. * Kova swung her tail happily behind her before she would look to the horn piece and frown. Oh! She had an idea! She would pick it up and walk towards Fianna and smile, nosing her back in return “Watch this for me?” she would wait for the fae’s response before she would follow after Ayaka. <Calder> After retreating from the sanctuary of the small cave he would start off up the northern pass once more. There was not much to hide behind but he would make due with what he had. Keeping to the stone nd boulders, he would skip from one to the other effortlessly as he continued along the path made by the pack. * Fianna would eye the bone, then Kova, then the bone before dipping her head to grab it up. “Ofsh coursh.” She said, wagging, a slight light in her eyes. * Kova swung her tail and smiled, nosing Fianna once more in thanks to her! She would then quickly move after Ayaka with the intent on finding out if anyone had trailed them or not, or, more importantly if anyone else was within the boundaries to the north. * Ayaka quiet a bit, in fact, wolfspirits had been the only pack she’d come across that remained so relatively staionary. But then, they had found a place worthy of such. Many packs had to follow the herds, as they did now. * Fianna would watch the two sisters trit away, the small bone tucked in her maw, tail hanging till, listening vigilantly for several long moments before she moved downhill to settle closer to the carcass, then settled the bone between her paws, unable to resist a bit of scritch scratching of her own teeth. Oh she’d watch it closely, of course. * Ayaka the pack as she bounded through the snow, falling still every so often to watch and listen. It seemed, for the most part, that they were alone. No doubt they hadn’t yet crossed into Calder’s packs territory. Just thinking of the roguish brute made Ayaka stop and snap at her fur a bit, nosing Kova as well. “Those travels would be interesting to hear about..” she finally ventured to comment in return to her sister. * Fianna still lay, crunching away at the bone Kova had asked her to watch, beside her the carcass of the dallsheep was nearly frozen, well preserved in the cold of the mountain range. It still had sevral good hunks of meat on it, for the others had been careful to leave some for all. * Darth would wake up and stretch his legs out before rolling back to his stomach to stand up. He shook the snow from his pelt and looked around. He would crunch through the snow as he started to move around, if he could see Ayaka and Kova, he would chuff a greeting in their direction as he swiveled his ears, listening for any sounds that may be heard. <Calder> Would continue to move up the slope until the wind of wolves seemed to pause him in his tracks. He would tilt his head in a favorable direction as it would offer to him the scents he had sought out for. He grinned and swung his tail about before moving along the chosen path. If the wolves rested in the open he’d surely come upon them. * Fianna settling beside the carcass as she looked south, lifting her nose to the winds. If their scent carried to Calder, his own would for the time being be masked from them. Was his frame visible against the snows yet? She would carefully stretch, testing her muscles against the injury as wellbas the cold. * Ayaka would perk at her sister’s words, turning to glance her way as she hopped up onto a rock next to a large pine tree before halting to look out over the vantage she’d found. Below just to the north, the small pack was nestled up against a copse of trees, for shelter and cover both, though they had not gone completely into the small copse. She could see a few forms moving about, and their scents had cast long to her. * Ayaka From this vantage, she swept her gaze east, west, and further south as well. If Calder was moving along their previous trail, Ayaka’s alert gaze would no doubt pick up on his black form soon enough. <Calder> Would continue to make his way towards the direction of the gathering of wolves. He would stop short, however, and dared not to get to close. He had settled himself behind a boulder and peered over it just to make sure he wasn’t in the way or hoped he wasn’t. He’d sit there for the moment and wait. * Darth would watch Fianna take up another mouthful of snow and listened; “What? no; I was asking why are you eating the snow?” He asked, still not understanding what she was doing. “I’ve never seen a wolf eat snow before.” He said, tilting his head. * Fianna ‘s eyes brightened in understanding. “Oh. Well… it melts in your mouth. Up here there aren’t any flowing streams so we have to eat snow to quench our thirst.” She had never had the experience of knowing something someone else did not, and she tried to be kind about it, even as she couldn’t help but feel slightly good at being able to help someone else. * Ayaka continued listening, “they sound very tasty indeed.” She licked her chops at the idea. “I don’t see anything really..” she commented. 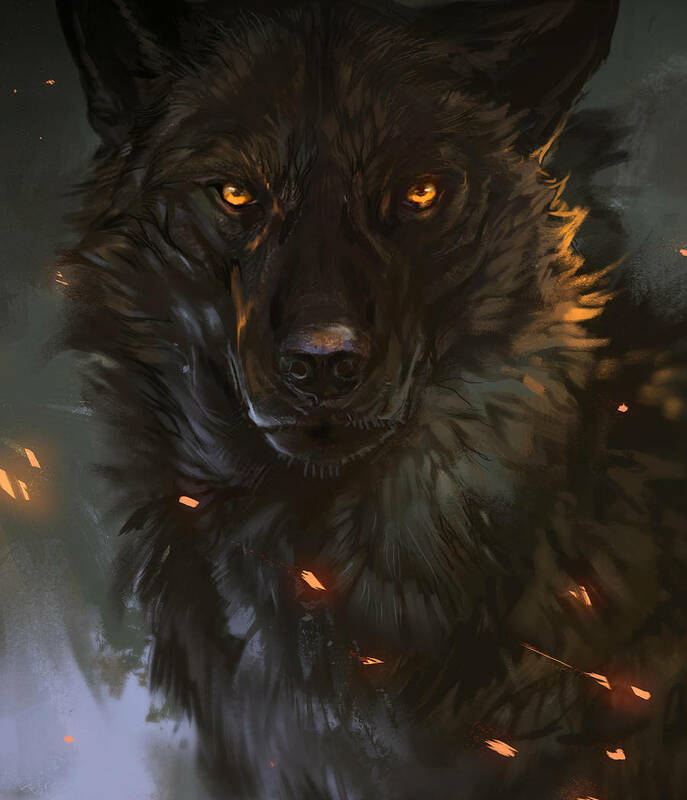 “Perhaps lets head back?” With that she would take the direct route downhill, heading back toward the gathering of woofs. * Darth would nod in understand; “Oh, that makes sense.” He said; before taking a small mouthful of snow into his mouth and feeling it melt in his mouth before swallowing the cool water. <Calder> Continued to watch from a distance for a moment longer before rising up and slowly making his way forward. There wasn’t much to hide behind now and he would likely not really bother to conceal his frame either. The dark voluptuous male would stride towards the two wolves Fianna and Darth. His eyes no doubt on the male for a longer moment but then refixed upon the other. * Fianna might have found. But then her hues fell on the muscular form of the large ebony brute, Calder, and she inadvertently gulped before her tail rose along with her head and ears. Though she was no longer in her own territory, she couldn’t show weakness. She stood, her stance belying the injury of her ribs, neither did she show aggression. “Calder…” she said, intrigue lacing her tones as she watched him closely. <Calder> »» into unknown territory as well. However… was it really unknown? * Fianna of travel?” She asked the question, hope springing in her heart. Maybe she was still naieve, maybe not, but she would ask all the same. * Fianna paused, unsure how to answer the male’s own question. “It feels as you would expect.” She finally said, her own words perhaps sharpening slightly. She didn’t like being toyed with, even if she found him intriguing. <Calder> »» Just a few more miles northwards and you will be within them. If the lady would allow… may I have the opprtunity to show them to you? As a good sign of my… assurance.” he paid no mind to anyone around him now, not even any one who approached. His deep amber eyes holding fast to Fiannas, eager for her response. <Darth> ‘Fianna, We can not spare you. If you wish to go, please allow someone to go with you.” He said in a whisper to the fae, knowing that it would be safer for the young fae. <`Raven> <Larka> *woke up stiff and sore. Her paw ached but relief when it wasn’t bleeding anymore. Standing up slowly she shook herself as she stared around her. She noticed a group of the pack around a strange brute and tail high she padded silently towards them wondering what was going on. * Fianna with her own, equally riveted upon him as she tried to match his tones. “I will acompany you… when the rest of my pack does so as well. You are welcome to stay, and speak with the Beta, for she will make the call of when we go.” Were her words wise? She didn’t feel in it her heart for she longed to follow, to see what his words had to offer in ernest. Her paws, however, stilled. * Fianna grinned at the idea. “Of course we should. I would love to see where you grew up.” She said, moving slowly through the deeper snow near the bottom of the hill. “Perhaps once we have settled, or found our alpha’s once again.” She nosed Kova, happy to be spending time with jer sister again. * Ayaka grinned at the idea. “Of course we should. I would love to see where you grew up.” She said, moving slowly through the deeper snow near the bottom of the hill. “Perhaps once we have settled, or found our alpha’s once again.” She nosed Kova, happy to be spending time with jer sister again. <Calder> »» Maybe it was his way to let the others know he’s met the fae. * Darth would watch the exchange happen before him, no longer was he by the fae’s side as she had moved forward; and had to trust the fae to know what to do. As Calder reached forward, he watched carefully, ready to strike if he were to harm the fae at all; but until such time, he would remain standing in his spot, watching. * Ayaka ‘s tongue lolled a bit from the hard work of moving through snow, nudging Kova some with her shoulder. “Perhaps once we are on the move, should you be near enough to me, you can tell me one of those wild stories.” She wondered what it would have been like to wander the grand world with naught but a sister at one’s side. <Calder> »» wave of his tail like a fan in his bitter sweet goodbye. The destination would be the meeting place he had designated. * Darth would continue to watch the exchange between the strange brute and Fianna as it came to a close. With Clader’s death stare, he knew at that point that the brute was one not to be trusted. He sighed and almost growled as Calder began to head out, but maintained his composure the best he could. He then padded up to Fianna’s side and looked to her. “Are you okay?” He asked her with concern.